This is the second time I’ve seen this billboard this week — once on the connector northbound near Turner Field and now at the intersection of Spring St. and North Ave — and thought, what tha….?! After a Google search, I now know that it’s a campaign for Cartoon Network. It’s pretty silly, but it’s certainly a nice change of pace from the vandal cows of Chick-fil-A. I saw that billboard yesterday and thought the same thing. 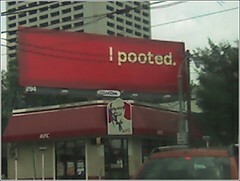 That KFC franchise owner must be pissed. OMG we saw this a few hours ago and laughed our arses off (and took a picture too of course) whoever’s putting that up there is going to get LOTS of publicity once they publish their real message! !